Do you have an old wooden ladder that has seen better days? 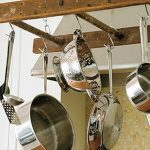 You can change it into a pot rack or clothes rack by hanging it horizontally from the ceiling and adding pot hooks or hangers. You can leave a weathered ladder for a rustic look or paint. Your preference. Sherry has ladders in Re-Funk’d for sale to make it even easier. 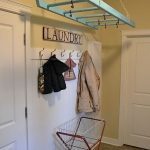 Always hang the ladder from the ceiling joists to ensure weight is supported. Easy to do using a stud finder.